It’s beautiful weather, we’re camping at a lake in Italy on an official camping. 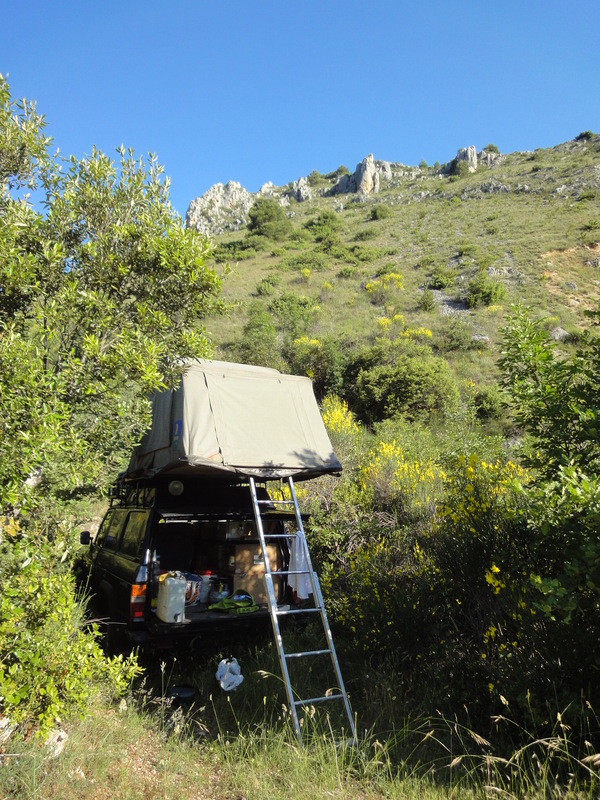 During our stay in Italy, we sleep only one night in the nature (N42 15.472 E13 46.312 – we can recommend it to everyone with a 4×4!). All the other nights, we stay on ‘normal’ camping spots. I’m not so fond of those, I notice. Not during this journey, at least. It costs a little fortune, finding a place is totally un-adventurous, and you have to walk half a marathon to the toilets, instead of just peeing next to the car (that’s only possible late at night, when everyone’s asleep, hehe). And while you’re hiking to the toilet, everyone observes you, sitting on their lazy asses in their camping chairs surrounded by gnomes. Like a village with too much social control. But, to be honest, it’s nevertheless quite okay to relax on this camping during 2 days (because driving every day stays tiresome, even in Europe), finishing my book, fishing some bream, and writing the post about Greece. 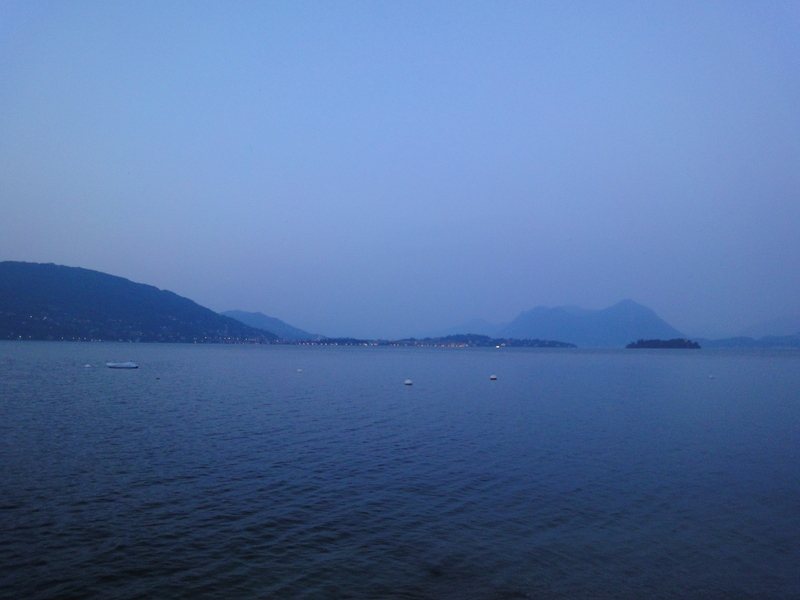 We drive along the shore of the marvellous Lake Maggiore. WHAT a beauty! The forested mountains surrounded by a few misty clouds funnily remind me of Southeast Asia. I’m the driver today, for a change. After a corner, I suddenly face a port on which it says Dogana Italiana. I’m surprised about how quickly we reached it and think: now comes the Italian border zone and we’ll first have to stop at the barrier, then show our identity cards at the next hut, later tell the guard that we really carry no drugs at the 3rd point, and so on. But the next port, 100m further on, turns out to be already the Swiss frontier. At both gates, they just look uninterested and signalise us to drive on. So we’ve just passed two borders within 10 seconds. WOW! What an unusual record time, compared with the 1 to 8 hours it would normally take us. And suddenly I feel completely overwhelmed about how fast we just entered my native country. Tears come to my eyes spontaneously. And again, I’m over the moon about how beautiful it’s here. Especially because it has been raining so much last night, that all the waterfalls splash over the mountain walls at full strength. I can truly say that Switzerland is one of the most beautiful countries in the world. All the Sfintesco’s have been cuddled, and a few Swiss friends and acquaintances met. Our next goal: Bern. Or to be more specific: the Hofstetter family! Of course, we couldn’t make it NOT to stop by at their home, after we ran into them in 7 different countries during our travel. So we spent two days with them, recalling overlander-stories about all the cool and crazy things we’ve been through together, admired the new bear park down town, and celebrated the unforgettable victory of Switzerland over Spain. Driving from Switzerland to Groningen at once, seemed too extreme to us. So we stopped in the middle at Katrin and Moni’s place, two funny German indigenous 😉 from Ansbach we had met in India. They showed us their favourite bar, the local castle, made us taste the best bread in town, showed us the nearby touristic city of Rothenburg, and again: football! This time we had the pleasure so see Holland win from Japan. We’re driving with Meopar for the last time during this journey. The countdown’s nearly finished. Ten, nine, eight, seven… But we still don’t realize it. For now, we still have the travel-feeling. So looking back on how it felt, is impossible. That will come later, when there’s more distance. Switzerland my so-called ‘home-home’ is already behind us, and Groningen my ‘home’ lies only 534km ahead us. A piece of cake, when you’ve travelled 65’000km on this planet. So, this message is being written offline, the computer’s on my lap and I only take a short look at the GPS from time to time. The landscape isn’t worth looking at constantly, the roads are smooth without potholes, and we expect no camels on our way, walking in the wrong direction while pulling a chariot. Nobody passes us anymore wildly honking and waving, because they’ve never seen a foreigner driving through their country before. For someone, who’s at home in his daily life, living with an agenda, it will probably feel very concrete if you say: today’s Sunday the 20th of June and we’ll be in Groningen around 18:30. But when you’ve been travelling for nearly 1.5 years… I can tell you… that you almost never know how late it is or which day of the week it could possibly be. Only sometimes you do, because you need to know if the embassy or the shops are open. Or how many days you have left till your visa expires. Or because it’s someone’s birthday at home, and you’d like to call or sms that person. But normally, you have zero feeling of time. I mean, why should you? The weather is different, your daily life is different, everything is different! And what’s so nice right now, is that we still have that weird feeling, even though we’re back in Europe. How we realize that? Well, when people ask us “When do you come back?” and we think: “Well, what shall we say? What does it matter to know? We’re back when we’ll be there!” We’re not used to all this hustle and bustle with time anymore. Planning – yes, we did a lot of that for sure. Daily! But very differently than at home. And of course, it won’t last long until we’re used to it again. But luckily not right now. Damn… I don’t want this to be over… now what am I supposed to read on the internet when I feel like daydreaming???? anyway, was an awesome time to “follow” you around big part of the world, I was happy, thrilled and excited reading your posts. I remember cheering with a glass of wine the day you decided to also post in English (life got so much easier for me…), I remember the kick when you painted the car, the feeling of highness when you chilled in India and the little rush when you were in Pakistan… the proud stories I told about you to lots and lots of people and the admiration after reading each post.